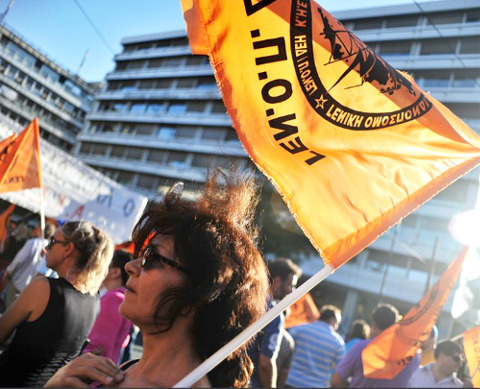 The Syriza government has said it will stop the proposed sell off of the Public Power Corporation (PPC) which is 51 per cent publicly owned but had been targeted for full-on privatization in 2016. “We will halt immediately any privatization of PPC,” Energy Minister Panagiotis Lafazanis told Greek television a few hours before officially taking over his portfolio. “There will be a new PPC which will help considerably the restoration of the country’s productive activities,” he said. Lafanzis also announced that the mostly state-run gas company, DEPA, will also not be privatized. Both the PPC and DEPA were due to be privatized under the conditions imposed by the Troika. Syriza’s program and manifesto, and its early actions to halt the further privatization of power generation and gas, suggest that the EU’s neoliberal approach to energy transition and climate protection is being challenged in a way that could have implications beyond the EU itself. Nevertheless, Greece is heavily dependent on fossil fuels. Therefore halting privatization should be seen as a crucial first step in what will be a longer journey toward a new energy system and ecological transformation. The election of Syriza comes at a time when the EU’s neoliberal approach to energy is in serious trouble. This approach was based on electricity market liberalization – ostensibly to promote ‘choice’ and ‘efficiency’ that was pursued via the Internal Market in Energy directive passed down to member states in 1996. The 2009 EU climate Directive also mandates a 20 per cent reduction of greenhouse gas (GHG) emissions, a 20 per cent share of renewable energy sources, and a 20 per cent savings in energy consumption by the year 2020 (based on 2005 levels). These are the so-called “20-20-20” targets. The EU has therefore maintained that liberalization and the scaling up of renewable energy go hand in hand. This is based on the groundless belief that only the private sector can drive renewable energy. The liberalization of Greece’s electricity sector has stretched over a 14-year period. In 2001 Greece passed a law allowing any company to produce electricity, thus ending the PPC’s monopoly. In 2007 individual consumers were gradually granted full “rights” to choose their energy supplier. Renewable energy companies were given special access to distribution and transmission systems. New feed-in tariffs (FiTs) were defined and introduced in 2007 and permits for offshore wind parks became possible. A modest amount of renewable energy was developed as a result of these measures, with the benefits going mainly to private companies and land owners. But in June 2013 Greece (along with Spain, Italy and others) announced a huge cut (44.7 per cent) in the FiT and the rush to solar and wind power in Greece ground to a halt. This has been the pattern across most of the EU as member states sought to control the mounting costs of the FiT programs. The main message here is that it takes a large amount of liberalization and, paradoxically, subsidies and government intervention, to generate a relatively modest amount of renewable energy. Importantly, renewable energy has made real headway in Germany as a result of an expansion of municipal control and public investment. (But even here coal generated 60 per cent more electrical power than renewable sources in 2014). In recent years many municipalities have decided to reclaim their local grids from private corporations. Germany has thus seen a major expansion of direct municipal provision of energy services. Those who refer to Germany’s successes in advancing renewable energy often appear unaware of, or perhaps reluctant to acknowledge, the role of public authorities in challenging privatization and intervening on behalf of the broader public. The EU’s dual priorities of energy market liberalization and climate protection are in fact incompatible with each other. Liberalization has led to an oligarchic situation where just five energy companies are dominant (EDF, RWE, EOn, GDF Suez and ENEL), consumer choice is mostly fictitious, and renewable energy companies rely on power purchasing agreements, ‘capacity mechanisms,’ and subsidies to survive. The failure of EU policy makes it clear that a new course is needed, and Syriza can show ‘another energy is possible’ in the EU and beyond. But Greece faces some particularly difficult challenges. Greece relies on domestic lignite (brown coal) for 70 per cent of its electrical power and imports large volumes of gas from Russia, Turkey and Algeria. However, the country enjoys an average of 300 days of sunshine per year and has considerable wind power and geothermal potential. Syriza will therefore inherit a situation where what is public (domestic lignite, overseen by the PPC) is environmentally destructive and what is presently private – renewable energy – will be needed in large volumes in order for Syriza to reduce its import bill and also develop renewable energy in accordance with its political platform. Some may conclude (including leaders and supporters of Syriza) that, when seen in the light of the many immediate challenges facing the new government, fossil fuel dependency is a problem that can be addressed over the longer term. Greece has cheap and abundant supplies of lignite coal, and this resource can not go unused – even though the ecological effects of lignite use are widely acknowledged. A typical power station using lignite emits 37 per cent more carbon dioxide per unit of power output than a power station using black coal. Lignite use has made a major contribution to Greece’s disproportionately large contribution to global warming and negatively impacts public health. Greece’s air pollution is higher than the OECD average, and the air pollution levels in Athens, exacerbated by the increase in the burning of wood, are today 15 times higher than the EU’s alert level. By halting the privatization of the PPC and DEPA, Syriza has already gone some way toward reaching the first goal. This is a hugely important first step, but Syriza must also strive to develop publicly owned and democratically managed renewable power, and generate domestic solar and wind supply chains. This is discussed below, and is explained in more detail in the TUED working paper Energy Democracy in Greece . Syriza can convene a broad-based and inclusive process for both developing and implementing a national energy transition plan. Preliminary proposals for the fossil-to-renewables transition can be offered as a starting point for a national debate and discussion around broad goals. The transition to a new renewables-based energy system will present many technical as well as political challenges, but decisions can be made based on the best available research and a thorough review of all of the available options. The short term benefits of a transition to renewable energy, such as cleaner air, improved public health, lower costs for energy in less than a decade, reduced dependence on fuels from abroad, significant job creation, etc., need to be highlighted alongside the importance of long-term climate stability and a sustainable political economy. The process must attempt to show how such a transition plan could strengthen community-based control and constructive autonomy. Unions, small businesses presently engaged in renewable power, representatives of social movements and progressive research institutions, might constitute the core of a commission of representative groups convened to develop the plan. Syriza supporters around the world with relevant expertise can also be engaged in the process. Engaging the union GENOP-DEH in the energy transition and the restructuring of the PPC are clearly important steps, as concerns about jobs will be uppermost. The workers in the industry can be integrated into the new ownership and oversight structures. They can be given a large degree of responsibility for operating and maintaining the systems, something they do every day. Sections of middle management can also be constructively engaged. Greece has the potential to produce enough renewable power to meet its needs from within its own borders, and do so in a way that will generate both jobs and savings. As noted above, Greece is today very dependent on fossil fuels both domestic (lignite or brown coal) and foreign (oil and gas). Its renewables sector is small and presently privately owned (excluding domestic solar thermal systems). From the perspective of reducing GHG emissions, it would of course be better to first substitute renewables for domestic lignite and then reduce the use of gas use later on. This is due to the fact that “burner tip” emissions from gas are almost a half of that generated from coal, and considerably less than half of lignite-generated “burner tip” emissions. But coal-to-gas fuel switching in Greece may not be the best option politically or economically during the first phase of the transition. Importantly, gas-fired power generation is the domain of a handful of private Independent Power Producers (IPPs) that have become present in Greece during the liberalization period. Reducing gas imports will therefore increase the portion of Greece’s energy that is under public control. And a fully ‘reclaimed’ PPC will ensure that the benefits of domestic lignite use are at least retained in Greece. During the first phase of Greece’s energy transition (perhaps a decade or so) the strategy should, as far as possible, entail a straight swap: domestic renewable energy should replace imported natural gas and oil, which together generates roughly 13 per cent of Greece’s electricity. However, oil-based generation has thus far served island communities or thermal power stations near Athens as a means of avoiding lignite-related air pollution. Therefore any reduction in oil-based electricity generation will need to address specific challenges of this nature. But if renewable energy generation can increase at a level of several GWs per year (Germany installed 7.6 GW of new solar capacity in 2012 alone) then the annual reductions in gas-based generation should be more or less comparable. The faster the deployment of renewables, the faster Greece’s bill for imported gas will be reduced. During the first phase of the energy transition it is important to announce a cap on lignite use in order to protect against the temptation to replace imported gas with more lignite-fired generation. A supplementary cap on GHGs from lignite could also serve a purpose, and retiring the oldest lignite-fueled power plants and introducing pollution control technologies where appropriate could complement such a policy. A cap on lignite use could be accompanied by announcing a moratorium on the construction of any new lignite-fired power plants. Clearly, Syriza must conduct a careful assessment of the environmental, social and economic implications of projects presently approved or under construction. Lignite reserves in Greece are plentiful and could last many decades, but the existing lignite-powered generation facilities presently operational in Greece will not last forever and an effective moratorium on new construction will mean that the fleet of lignite-fired stations will eventually become dilapidated and will have to be decommissioned. The trajectories for the phase out of lignite use will, however, depend on how fast renewable energy can be scaled up in Greece, and how technical and financial challenges are met and obstacles negotiated. Given the significant number of workers engaged in lignite mining, transportation and power generation, workers and communities that depend on lignite need to be reassured that the transition away from lignite is not going to happen without their active involvement and it will be stretched out over a period of years. Firing workers is not on Syriza’s agenda, under any circumstances. No worker or community will be asked to pay a disproportionate price for the energy transition while others in Greece (and globally in the form of reduced emissions) reap the benefits. A set of robust protections and guarantees need to be given priority in order to avoid alienating the workers and communities likely to be affected by a shift away from lignite – however far in the future that shift may actually be. A large and rapid deployment of renewable energy in Greece is possible. But it will need to be grounded in a stable financial model, which means finding a way to recover investments in the system, operation and maintenance costs, and perhaps generating surplus revenue for upgrades and new investments. In the EU, incentives like the FiT have allowed for individuals, small businesses, and even cooperatives, become partially independent of the grid. However, this means the costs to maintain and renew the system are shifted to those who are not “prosumers” – mostly people without property and/or disposable income. Furthermore, the rapid deployment of renewable energy raises the problem of intermittency (the wind does not always blow, nor the sun always shine) which will require the development of new ‘smart’ grid options and technologies that can integrate and coordinate many different feed-in points. FiTs therefore probably have only a limited role in the energy transition. Renewable energy cooperatives could also play an important role. In the many instances where public utilities have become marketized and profit-driven in accordance with the neoliberal agenda, the growth of cooperatives has been seen as a positive development. Furthermore Germany’s 700 renewable energy cooperatives have provided a launch pad for remuncipalization of power generation in over 40 cities. Cooperatives have also helped solidify popular support for Germany’s relatively impressive shift toward renewable power. Lafanzanis’ statement that “there will be a new PPC” is particularly relevant here. The PPC could work with municipalities, unions and communities to drive the transition to renewable energy in a way that is ambitious enough to meet emissions reduction targets and reduce fuel costs relatively quickly. The PPC already has a presence in renewable energy and therefore some experience to offer, particularly with regard to larger installations. A reformed and reoriented PPC could play the role of buyer and installer of PV and do so in a way that spreads the benefits more evenly than is the case with the ‘prosumer’ model. A reformed PPC can therefore be a driver of renewable energy deployment in Greece. Indeed, there have been instances where utilities have been known to pivot toward on-site generation of solar, often as a preemptive measure, aimed at moving into and enclosing ‘disruptive’ market competition. In Greece, the PPC can be instructed to play a role in helping, rather than hindering, both the deployment of renewable energy and aggressive end-use energy conservation. The effort to build energy democracy in Greece may wish to situate municipal-based power at the center of a new energy system with a reformed PPC playing a coordinating and technical role. An ambitious deployment of renewable energy can also create significant numbers of jobs in Greece. Solar PV manufacturing is today dominated by a few countries, as is wind turbine production. Jobs can, however, immediately be created in the production of basic components and in the construction, installation and maintenance of renewable energy projects. Large-scale deployment will also stimulate demand for cables and connectors and other electrical components. Array planners are also needed. Clearly, the scale and speed of the planned deployment will have an impact on the prospects of manufacturing gaining a foothold in Greece and also its chances of future expansion. Publicly-owned manufacturing facilities or cooperatives are not inconceivable, but phase one may require ‘joint venture’ arrangements in order to allow for the transfer of skills and knowledge. It is possible to imagine the installation and related work being performed by PPC employees earning decent wages. The PPC could also be the primary purchaser of solar modules, inverters and other components. Public buildings – schools, hospitals, etc. – could be assessed in order to see if they are suited for solar PV, and a plan developed to install PV systems over the course of the next decade or two. In Greece, the largest single classification for buildings are public schools. Already the Centre for Renewable Energy Sources (CRES) has explored possibilities of photovoltaic systems development on the rooftops of schools, in partnership with Greece’s School Buildings Organization (SBO). A national energy transition plan could involve developing an inventory of public buildings and spaces in order to assess their capacity for on-site power generation. The transition to renewable energy in Greece will require commitments of capital. But when measured against the financial, health-related and ecological costs of continuing with fossil fuels, renewable energy is the best possible social investment. For a more specific quantification, we can consider the cost of the public sector’s annual electricity bill, which can then be calculated over 20 years based on recent trends. This cost can be then compared to the cost of major solar PV deployment in those facilities. The price of globally sourced PV, along with installation and maintenance costs are today such that PV systems can pay for themselves within 5 years after which time the electricity supply to these facilities will be virtually free. There is every likelihood that the electricity costs to sustain the public sector – including schools, hospitals, and other government buildings – will actually fall quite dramatically over a 20-year period. Capital could also be sourced from a variety of sources. In 2012 the PPC made a pre-tax profit of €276-million. A ‘reclaimed’ PPC would provide the option of redirecting capital to renewables. Another option is for PPC to issue bonds against its future revenues. These can be issued domestically rather than internationally and provide a tried and trusted mechanism for financing public services. Another possibility is a carbon tax. There are numerous options for designing a carbon tax, such as imposing it on major industrial emitters in Greece, or through a charge on petrol. Greece consumed an average of 343,000 barrels of crude oil per day in 2011, of which almost half (46%) was used for transportation. According to the IEA (2009 data) compared with other OECD Europe countries, Greece has a relatively low tax on gasoline and diesel. A small carbon tax of a few cents on a liter of petrol would generate significant revenue that could in turn be dedicated to investment in renewable energy. This article first appeared at Trade Unions for Energy Democracy.